Looking to keep your feet dry? These boots will do the trick. They’re made to withstand the wettest, ugliest and muckiest weather Mother Nature can throw at you. Muck is kept at bay thanks to the high-grade rubber exterior. The rubber has a high-gloss finish with four inches of Neoprene at the top. It’s tough, durable and 100% waterproof. The boots are 12 inches tall so they’ll protect your feet and legs. But the boots are also lightweight. Weighing just three and a half pounds, they won’t tire out your legs and ankles. Wet, muddy terrain is slippery, but these boots are ready to keep you steady. An MS-2 bobbed molded outsole provides solid traction even on uneven, slick ground. While the outsole is thick and durable, it’s not heavy. You’ll be able to step lightly — like you’re wearing a sneaker. Each boot weighs three and a half pounds. The boots have a reduced heel, which provides excellent grip and slip resistance. Aside from walking through the woods, they also keep you steady on uneven sidewalks. Fleece lines the inside of the boots. They’re soft, comfortable and warm. They’re also comfort rated from -40 degrees to 40 degrees. They have a 2 mm thermal foam footbed which provides additional warmth. A dual-density EVA insole combines with a gel insert to cushion your feet and absorb shocks to the footbed. Plus, a layer of 4 mm neoprene insulation, combined with the fleece, keep your feet dry and warm. I was impressed with how easy the boots are to keep clean. Mud and snow have a hard time sticking to the high-gloss exterior. A clean, damp cloth should be all you need to remove any dirt. The boots are designed to look shiny and new even after years of use in harsh weather. Finally, I’m often a bit wary of rubber boots without laces. They can sometimes be cumbersome to put on and take off. But the pull-tab allows for quick, easy wear. I didn’t have any major problems with the boots themselves, but finding the right size sure was difficult. While thick socks can help fill the boot, you’ll want to make sure the boots aren’t too big. If your feet have too much space to move around, you can develop blisters. I’m also not thrilled with the lack of insulation. With most boots, I’d wear thick socks to keep my feet warm in non-insulated boots. But thick socks pose some unique challenges with MuckBoots. The problem is that the boots often have more space in the foot area than the calf section. While thick socks help keep your feet warm, the extra thickness might make the boots feel too tight against your calves. Also, taking the boots off can be messy. The pull-tab works well, so my feet never felt stuck. However, pulling the boot off does tend to make it wobble around. On more than a few occasions, the mud and snow on my boots ended up getting flung across the room. I’d recommend taking your boots off before you walk inside. Finally, I wish the boots were a bit less clunky. Between the shape and the materials used, I occasionally felt like I flailed about rather wildly. The feeling of stomping around was especially pronounced whenever I’d walk in deep snow or thick mud. The boots made me feel sure-footed but not always very graceful. I don’t think they’re a good choice for hunting game like deer or wild birds. Most animals will hear your approach from quite a distance. Many people had issues finding the correct size. CK said she normally wears a 6.5 in athletic shoes and boots, but even a size 6 in MuckBoots felt too big. Sizing can be frustratingly inconsistent. If you get the right size around your feet, the boots might be too tight around your calves. You probably won’t be able to fit much more than a thin pant leg into the boots. Tight socks might make the boots difficult to put on. Terra said she thought the manufacturer used a men’s sizing scale. I never found any evidence that was true, but it does show how confusing sizing can be for many buyers. The boots are specifically cut for female feet, which many buyers praised. Kristen said her previous pair of boots were unisex and felt clunky. But the sleeker cut of these boots fit her foot much better. Many people also praised the ankle and calf protection. K.C. said they worked great for plowing snow when on a four-wheeler or even fishing in rivers. They’ll keep your feet and legs dry even if you’re standing in running water. Finally, many of the comments led me to be skeptical about the promised comfort ratings. For example, Dax45 said her feet felt cold in 30-degree temperatures. She had serious doubts about the ability of the boots to protect her feet in -40 degrees. I tend to agree. The boots do a better job at preventing overheating in mild temperatures than they do at keeping your feet warm in frigid temps. They’re great for the crisp temps of fall instead of the coldest parts of winter. The Original MuckBoots Woody Max are the ones to wear if you have to walk through anything cold, sloppy or gross. 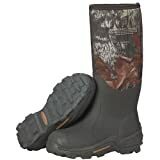 They can handle running water, deep mud, thick underbrush and much more. The high-grade rubber exterior protects your feet and calves while the MS-2 molded outsole securely grips slippery and uneven ground. The biggest potential problem will likely be sizing. You probably don’t want to go up in size. The fit will be closer to your street shoe size instead of your typical boot size. Plus, many people find the boots fit tightly around the calves. But if you find the right fit, these boots will serve you well. They’re durable, tough and built to last. Plus, unlike unisex boots, these boots are designed to fit the unique curves of a woman’s foot. No matter where in the wilderness you need to walk, these boots will be an excellent traveling companion.